There’s nothing more powerful than an idea whose time has finally come, and in the world of light pickups that particularly prescient thought-form has manifested as turbodiesel power. After decades of denying diesel to anyone outside the heavy-duty truck world, both American and Japanese brands are starting to offer turbodiesel engines across a much wider range of pickup choices. 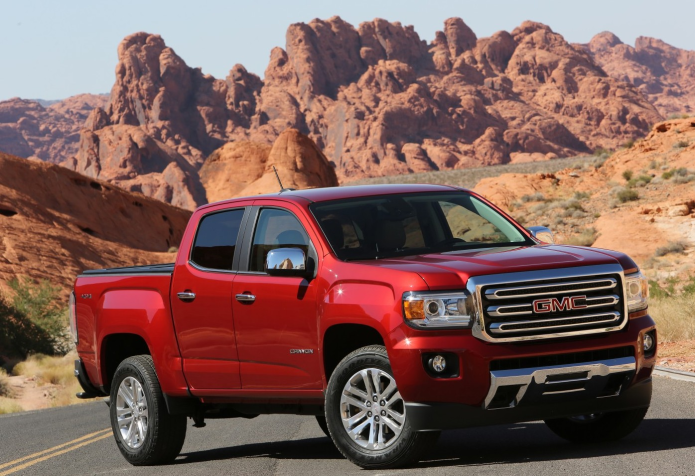 The 2016 GMC Canyon Diesel (and its Chevrolet Colorado Diesel twin) is perhaps the most aggressive and intriguing example of this new drivetrain philosophy on the market. There was little risk when Ram introduced its EcoDiesel full-size pickup just a few short years ago, as pent-up demand among half-ton customers was palpable (and borne out by the fact that Fiat-Chrysler can’t churn out enough diesel engines to meet demand). The GMC Canyon Diesel is a different story, however, since it’s the first, and only, mid-size truck to add a non-gasoline option to the order sheet. Whereas turbodiesels have long been prized for their exceptional torque and longevity in larger workhorse pickups, mid-size customers typically aren’t looking to tow a mountain. Instead, they seek the best balance between the utility of an open-bed hauler and a form-factor that fits into their daily lives with minimal hassle. This marketing pivot is reflected by the Canyon Diesel’s details. For starters, the unit sitting under the hood of the mid-sizer offers four cylinders, rather than the six or eight that are more common in the full-size diesel world. Although torque remains solid – 369 lb-ft – it’s clear that the 2.8-liter unit has been tuned specifically to maximize fuel efficiency and smooth out the bumps (read: vibration) that are a common fact of life in heavy duty diesel applications. The advertised numbers are big. On the highway the Canyon Diesel returns 31-mpg, which is a full 4-mpg better than the gas-powered four-cylinder engine that’s standard with the truck, and a whopping 7-mpg improvement over the most efficient version of the Toyota Tacoma, which is the segment-leader in terms of sales. Around town the difference is less starling – checking in at 22-mpg – but still better than any other pickup in its class. I saw more dismal fuel consumption during my time with the pickup, but that’s due to -40 F degree weather that dominated our week together, which made for operating conditions that no internal combustion engine can be expected handle in an efficient manner. In addition to the promise of fuel pump frugality, the Canyon Diesel has also seen its engine sent to finishing school. General Motors, which imported the 2.8-liter turbodiesel to North America from elsewhere in its global fleet, didn’t simply drop the four-cylinder between the Canyon’s front fenders and call it a day. Instead, it altered the unit’s balance shafts, oil pan, and intake in order to reduce diesel shake as much as possible, and it works together with sound deadening materials that have been added to the truck’s firewall, as well as a unique torque converter that works to absorb, rather than transmit vibrations through the driveline. It all adds up to a remarkably quiet experience from inside the vehicle, which is what matters most to potential buyers who will be less concerned with the clatter that’s still detectable when standing beside the idling Canyon. Of course, even if you were wearing earplugs and wrapped yourself in a space suit, the GMC’s turbodiesel motor betrays itself once you stand on the accelerator. 181 horsepower complements the Canyon’s broad torque range, and while it’s enough to keep up with the flow of traffic, forward progress is modest in most driving situations. This isn’t a complaint – and even the V6-powered versions of the Colorado and Canyon aren’t all that quick – but it’s something that mid-size truck buyers making the transition to diesel will have to get used to. A six-speed automatic is the sole gearbox on offer with the Canyon Diesel, and four-wheel drive is optional (and was installed on the model I drove). The vehicle also comes with a standard trailer brake control and offers the availability of diesel exhaust brake for those who plan to put the pickup’s 7,700 lbs of towing capacity to the full test. It’s worth noting that that number represents a 700 pound boost over the V6 Canyon, and puts it roughly on par with the stoutest mid-size SUVs. The rest of the GMC Canyon package remains unchanged when you order it in Diesel trim, but you’ll have to stick with the crew cab body style (with its four full-size doors) rather than snag an extended cab model. There are two available bed lengths that can be grafted onto the Canyon Diesel, and trim levels are restricted to either SLE or SLT, locking out the base SL and Canyon editions of the pickup. As a daily driver, the Canyon Diesel’s large, but not-quite full-size dimensions are a good compromise for urban commuting. I was able to park the GMC in the alley behind my home without any real hassle, and the vehicle never felt ponderous when trying to find a spot on the street. Handling is also more akin to a large crossover than a traditional pickup, an attribute that can’t be said for either the Tacoma or the Nissan Frontier against which the Canyon competes. The SLT can be loaded with gear, including adaptive cruise control, forward collision warning, parking assistance, and a lane departure warning system, and the GMC IntelliLink infotainment suite is compatible with Apple CarPlay and offers a 4G LTE Wi-Fi hotspot. This level of equipment is a far cry from the stripped-down mini-trucks of old, showing that the pushed-out proportions of the new class of mid-size pickups are matched by a standard of luxury and connectivity that doesn’t trail far behind their full-size counterparts. Still, do you really want to pay more for the Canyon Diesel? GMC has priced the model at $3,730 more than a comparable gas-only version of the truck, which means if you order the top-range SLT you could be looking at well over $40,000 once options have been factored into the equation. Current fuel prices have put the truck brand in a bit of a tight spot when it comes to focusing on the value offered by the Diesel’s efficiency improvement versus the V6, as it would take quite a long time for fuel savings to catch up to the price gap between the two drivetrains. Given that the average trailer load in the United States happens to hover around 3,500 lbs – a figure that’s well within the operating spec of even the four-cylinder Canyon and Colorado – it would also seem that those seeking the 100 lb-ft of added torque for towing purposes are themselves a small niche of potential customers. GMC is hoping to snag a humble 10 percent of customers with its turbodiesel honey. Personally, I’m all for choice. In my opinion, the more options new truck buyers have, the more likely they are to find a pickup that fits into their budget and specific driving needs. GMC claims that the mid-size Canyon isn’t intended to appeal to full-size shoppers, but rather those whose lifestyles demand a practical truck that drives smoother and smaller than the usual cast of characters. With the Diesel, you can add ‘more efficiently’ to that list of attributes – but the cost of entry might not be worth it for the majority of pickup fans staring down some of the lowest fuel prices in a decade.